Here's a part I'll bet you can use. 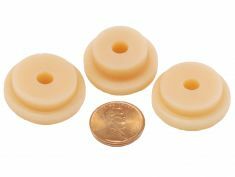 These are Urethane isolation grommets for Philco chassis such as the 37-610. This chassis has a separate RF sub-chassis mounted in the center of the main chassis, and it's suspended there by three of these grommets. The grommets are usually hard as rock and crumbling. These grommets are the right size, and the right hardness, and will reduce vibrations. Note: The Philco Radiobar 37-61 uses a similar part but these are a little too thick These can be used if you jam them in. Two pieces of this set are identical. They go on the sides of the sub-chassis. One is smaller in diameter, and thicker. It supports the back of the sub-chassis.